Congratulations to the both of you and to all our applicants who demonstrated again the passion and devotion child support workers have for their profession!! The ERICSA family welcomes you to Daytona Beach! Click here to read the Fall 2017 ERICSA Newsletter. 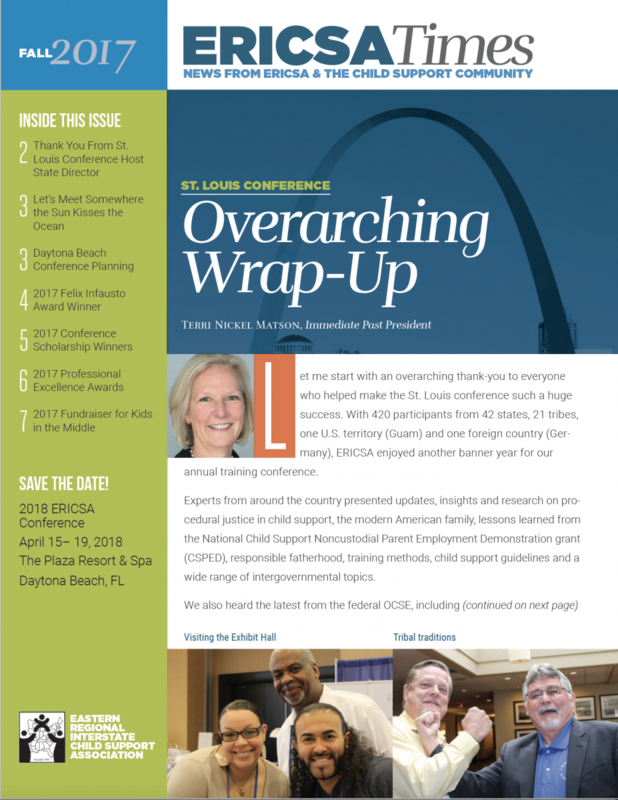 Click here to read the winter 2017 ERICSA Newsletter. Rob Velcoff wins the Domestic Relations Association of Pennsylvania (DRAP) 2016 President’s Award. The President’s Award is bestowed on someone who is not an employee of the Domestic Relations Office but has made a significant impact on the area of child support. Rob is from the New York State Division of Child Support Enforcement, where he has worked for over 26 years. Rob is responsible for all interstate policy and program issues, and is recognized expert in child support issues, as evidenced by his extensive appearances at multiple conferences. Rob served as the President of ERICSA in 2011. Please join us in congratulating Rob! On August 30, 2016, the President signed the Ratification for the Hague Convention on the International Recovery of Child Support and Other Forms of Family Maintenance (Hague Child Support Convention.) This Convention contains provisions to establish uniform, inexpensive and effective procedures for the processing of international child support cases. The Office of Child Support Enforcement will be issuing policy guidelines for state child support agencies to process Convention cases under UIFSA 2008. The effective date for the Hague Child Support Convention in the United States is set for January 1, 2017. Congratulations to Lara Webb Fors! Lara is an active member of the ERICSA community, having served on the Board of Directors for over ten years and as a former President of ERICSA. Lara recently won the Public Service Practitioner Award during the 18th Annual Women’s Justice Awards 2016 hosted by the Missouri Lawyers Weekly. An article about Lara's award is posted at http://molawyersmedia.com/2016/04/11/lara-webb-fors/. The Board of the California Child Support Directors Association (CSDA) is seeking a highly qualified professional to effectively lead, coach, develop, and retain the Association's small but efficient staff (2 FT and 1 PT staff members) and manage a budget with annual revenue of approximately $600,000. CSDA was established in 2000 as a non-profit association to represent the local child support directors of California's counties. CSDA is governed by a Board of Directors comprised of members that represent counties throughout California. This "at-will" position is an excellent opportunity for a senior-level executive with experience and the ability to focus on management, advocacy, membership recruitment, strategic planning, and administration and fiscal management. This position offers a highly competitive compensation and benefit package; the starting salary for the Executive Director will be based on the competitive labor market and the successful candidates' qualifications, experience, and salary history. Ralph Andersen & Associates is currently providing recruitment services to CSDA. Additional information regarding this position can be found on Ralph Andersen & Associates' website under the career opportunities tab or at http://goo.gl/2EXQYF.